کرمی, خلیل, قادر, سرمد, موسوی, سید وحید. (1397). شناسایی حالت‌های بازتاب، جذب و انتشار امواج راسبی انتشار یابنده بالاسو. مجله ژئوفیزیک ایران, 12(2), 23-37. خلیل کرمی; سرمد قادر; سید وحید موسوی. "شناسایی حالت‌های بازتاب، جذب و انتشار امواج راسبی انتشار یابنده بالاسو". 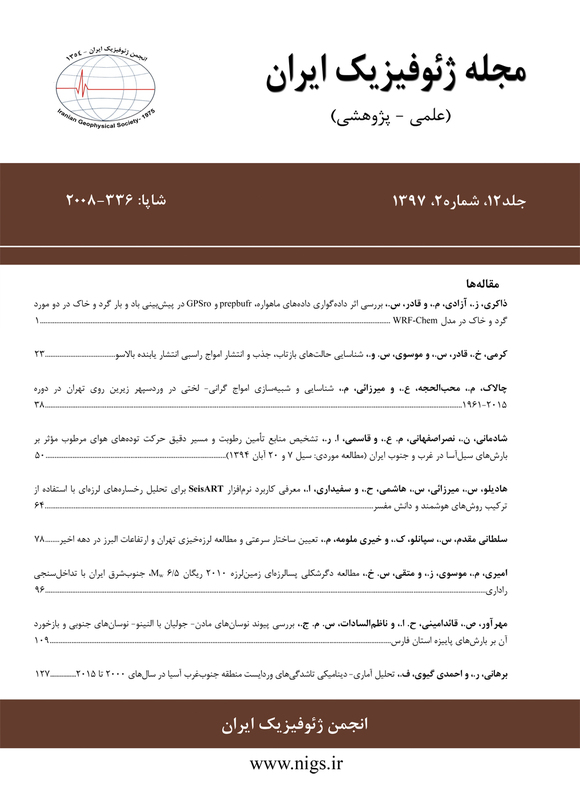 مجله ژئوفیزیک ایران, 12, 2, 1397, 23-37. کرمی, خلیل, قادر, سرمد, موسوی, سید وحید. (1397). 'شناسایی حالت‌های بازتاب، جذب و انتشار امواج راسبی انتشار یابنده بالاسو', مجله ژئوفیزیک ایران, 12(2), pp. 23-37. کرمی, خلیل, قادر, سرمد, موسوی, سید وحید. شناسایی حالت‌های بازتاب، جذب و انتشار امواج راسبی انتشار یابنده بالاسو. مجله ژئوفیزیک ایران, 1397; 12(2): 23-37. در این مطالعه،بازتاب مستقیم فعالیت­های موجی از پوشن­سپهر به وردسپهر یا جذب و انتشار این امواج در پوشن­سپهر شناسایی می­شود. به­این­منظور، کمیت­های ضریب بازتاب پرلویتز- هارنیک، شار گرمایی، گرمایش ناگهانی پوشن­سپهری، ضریب شکست امواج راسبی و احتمال انتشار بهینه امواج راسبی محاسبه، تحلیل و بررسی شده­اند. برای اجرای تحقیق، از داده­های بازتحلیل ECMWF (ERA-Interim) در بازه زمانی 2014-1979 و در فصل زمستان (نوامبر- مارس) در نیمکره شمالی استفاده شده است. بررسی شاخص ضریب بازتاب پرلویتز- هارنیک نشان می­دهد که در بازه زمانی 34 ساله بررسی شده در 10 زمستان، پوشن­سپهر حالت بازتابی و در 24 زمستان، حالت غیربازتابی (جذب یا انتشار امواج راسبی) داشته است. بررسی این شاخص نشان می­دهد احتمال بازتاب مستقیم امواج راسبی از پوشن­سپهر به وردسپهر در پاییز و اوایل زمستان (نوامبر- دسامبر) کمینه است. در بازه زمانی ژانویه- مارس، پوشن­سپهر حالت بازتابی داشته و بیشترین احتمال جفت­شدگی بین پوشن­سپهر و وردسپهر از طریق بازتاب امواج راسبی در اواسط زمستان و اوایل بهار است. بررسی شاخص شار گرمایی نشان می­دهد استفاده از تعریف موج به­عنوان پریشیدگی از حالت میانگین مداری نسبت به تعریف موج به‌عنوان پریشیدگی از میانگین زمانی، مزیت دارد. در سال­هایی که پوشن­سپهر حالت بازتابی دارد، تنها در 33 درصد از زمستان­ها احتمال رخداد پدیده گرمایش ناگهانی پوشن­سپهری وجود دارد. این در حالی است که در زمستان­هایی که پوشن­سپهر حالت غیربازتابی (جذب یا انتشار امواج راسبی) دارد، در حدود 62 درصد از زمستان­ها احتمال رخداد این پدیده وجود دارد. نتایج بررسی دو شاخص ضریب شکست امواج راسبی و احتمال انتشار بهینه امواج راسبی نشان می­دهند که در حالت پوشن­سپهر غیربازتابی نسبت به پوشن­سپهر بازتابی، احتمال انتشار و نفوذ امواج راسبی از وردسپهر به پوشن­سپهر زیرین (100-50 هکتوپاسکال) در فاصله عرض جغرافیایی 90-70 درجه شمالی بیشتر است. We detect the downward planetary wave reflection from the stratosphere back to the troposphere in the Northern hemisphere extended winter season (November-March), using ECMWF (ERA-Interim) reanalysis data (1979-2014). In the previous studies, the wave activity is defined as departure from a long-term time mean. However, we demonstrate some of the shortcomings of the above-mentioned definition. For instance, negative values of the heat flux at the lower stratosphere does not necessarily show the downward wave propagation, but a lower upward wave propagation. Perlwitz-Harnik index of reflection is used to categorize the stratospheric wind regimes into the two distinct states: reflective and non-reflective. Negative and positive values of this index indicate a reflective and non-reflective (either absorptive or propagative) stratospheric states, respectively. Our results show that the negative values of this index during early winter (November-December) suggests that the downward wave coupling is less likely to happen in early winter and most of the direct downward wave coupling occurs during mid-winter and early spring (January-March), which is in agreement with previous studies. Furthermore, 10 stratospheric winter states (out of 34) are reflective, while the remaining states (24 winters) are non-reflective winters. Winters whose their stratosphere experiences a major Sudden Stratospheric Warming (SSW) event is identified to detect the absorptive states of the stratosphere. Our analysis suggests that only in the %33 of the winters with reflective stratosphere a SSW can occur. In the %62 and %38 of the winters with non-reflective stratosphere, a SSW event can occur or Rossby waves can propagate upward freely to the upper stratosphere, respectively. Analysis of the heat flux at the lower stratosphere (50 hPa) using two different definitions (wave as a deviation from the time mean and as a deviation from the zonal mean) provides some useful information. If the waves are defined as a deviation from the zonal mean (), during the reflective years, this quantity is negative (indicating a downward reflection of wave activity from the stratosphere to the troposphere). Similarly, during non-reflective years, this quantity has positive values (suggesting either upward wave propagation or absorption by the mean flow). While the above-mentioned definition is in harmony with our expectation, the definition of the wave as a deviation from the long-term time mean () results in an oscillation curve around zero line, without any useful information either about the upward wave propagation or a downward wave reflection. In order to understand the role of mean flow in influencing the upward wave propagation, we calculate the Rossby wave refractive index (or vertical wavenumber alternatively). Our analysis show some of the problematic features (for instance, a very noisy structure) of this index in understanding the differences of reflective and non-reflective stratospheric states. This is most probably due to the overlapping of very large or very small values of the refractive index which cancel each other and results in a noisy structure. To overcome this problem, we use a modified diagnostic tool (compared to the refractive index), probability of favorable propagation condition for Rossby waves. This index has some clear advantages over the traditional refractive index. Analysis of this index shows that during the non-reflective stratospheric states, Rossby waves are more likely to propagate upward (with higher values of the probability), in comparison to the reflective stratospheric regimes which is a superior demonstration of the influences of the basic mean flow on the upward wave propagation over the traditional refractive index. Ambaum, M. H. P., and B. J. Hoskins, 2002, The NAO troposphere–stratosphere connection: Journal of Climate,15, 1969-1978. Andrews, D. G., Leovy, C. B., and Holton, J. R., 1987, Middle Atmosphere Dynamics: Academic Press. Baldwin, M. P., and Dunkerton, T. J., 2001, Stratospheric harbingers of anomalous weather regimes: Science, 294, 581-584. Baldwin, M. P., and Dunkerton, T. J., 1999, Propagation of the Arctic Oscillation from the stratosphere to the troposphere: Journal of Geophysical Research, 104, 30,937-30,946. Charlton, A. J., and Polvani, L. M., 2007, A new look at stratospheric sudden warmings, part I, climatology and modeling benchmarks: Journal of Climate, 20, 449-469. Charlton, A. J., O’Neill, A., Lahoz, W. A., Massacand, A. C., and Berrisford, P., 2005, The impact of the stratosphere on the troposphere during the southern hemisphere stratospheric sudden warming, September 2002: Quarterly Journal of the Royal Meteorological Society, doi:10.1256/qj.04.43. Charney, J. G., and Drazin, P. G., 1961, Propagation of planetary scale disturbances from the lower into the upper atmosphere: Journal of Geophysical Research, 66,83-109. Chen, P. C., and Held, G., 2007, Phase speed spectra and the recent poleward shift of Southern Hemisphere surface westerlies: Geophysical Research Letters, 34, doi=10.1029/2007GL031200. Grise, K., Thompson, D., and Forster, P., 2009, On the role of radiative processes in stratosphere-troposphere coupling: Journal of Climate, 22, 4154-4161. Haynes, P. H., Marks, C. J., McIntyre, M. E., Shepherd, T. G., and Shine, K. P., 1991, On the downward control of extratropical diabatic circulations by Eddy-Induced Mean Zonal Forces: Journal of the Atmospheric Sciences, 48(4), 651-679. Hines, C. O., 1974, A possible mechanism for the production of sun weather correlations: Journal of Atmospheric Science., 31, 589-591. Holton, J. R., 2004, An Introduction to Dynamic Meteorology: Elsevier. Ineson, S., and Scaife, A. A., 2009, The role of the stratosphere in the European climate response to El Nino: Nature Geoscience, 2, 32-36. Ineson, S., Scaife, A. A., Knight, J. R., Dunstone, J. C., Gray, L. J., and Haigh, J. D., 2011, Solar forcing of winter climate variability in the Northern Hemisphere: Nature Geoscience, 4, 753-757. Karami, K., Braesicke, P., Kunze, M., Langematz, U., Sinnhuber, M., and Versick, S., 2015, Modelled thermal and dynamical responses of the middle atmosphere to EPP-induced ozone changes: Atmospheric Chemistry and Physics Discussion, 15, doi:10.5194/acpd-15-33283-2015. Karami, K., Braesicke, P., Sinnhuber, M., and Versick, S., 2016, On the climatological probability of the vertical propagation of stationary planetary waves: Atmospheric Chemistry and Physics, 16, 8447-8460, doi: 10.5194/acp-16-8447-2016. Kidston, J., Scaife, A., Hardiman, S., Mitchell, D., Butchart, N., Baldwin, M., and Gray, L., 2015, Tratospheric influence on tropospheric jet streams, storm tracks and surface weather: Nature Geoscience, 8, 433-440. Kodera, K., and Kuroda, Y., 2000, Tropospheric and stratospheric aspects of the Arctic Oscillation: Geophysical Research Letters,27, 3349-3352. Kodera, K., Mukougawa, H. and Itoh, S., 2008, Tropospheric impact of reflected planetary waves from the stratosphere: Geophysical Research Letters, 35, L16806, doi: 10.1029/2008gl034575. Kunz T., Fraedrich, K., and Lunkeit, F., 2015, Synoptic scale wave breaking and its potential to drive NAO-like circulation dipoles: A simplified GCM approach: Quarterly Journal of the Royal Meteorological Society, 135, 1-19. Li, Q., Graf, H. F., and Giorgetta, M. A., 2007, Stationary planetary wave propagation in Northern Hemisphere winter-climatological analysis of the refractive index: Atmospheric Chemistry and Physics, 7, 183-200, doi:10.5194/acp-7-183-2007. McInturff, R. M., 1978, Stratospheric warmings: Synoptic, dynamic and general-circulation aspects. NASA Reference Publ. NASA-RP-1017, 174 p.
Matsuno, T., 1970, Vertical propagation of stationary planetary waves in the winter Northern Hemisphere: Journal of the Atmospheric Sciences, 27, 871-883. Nath, D., Chen, W., Graf, H. F., Lan, X., Gong, H., Nath, R., Hu, K., and Wang, L., 2016, Subtropical potential vorticity intrusion drives increasing tropospheric ozone over the tropical central Pacific: Scientific Report, 6, doi: 10.1038/srep21370. Newman, P. A., and Rosenfield, J. E., 1997, Stratospheric thermal damping times: Geophysical Research Letters, 24, 433-436. Plumb, R. A., and Semeniuk, K., 2003, Downward migration of extratropical zonal wind anomalies:. Journal of Geophysical Research, 108,doi:10.1029/2002JD002773. Riviere, G., 2011, A dynamical interpretation of the poleward shift of the jet streams in global warming scenarios: Journal of Atmospheric Sciences, 68, 1253-1272. Schmitz, G., and Grieger.,N., 1980, Model calculations on the structure of planetary waves in the upper troposphere and lower stratosphere as a function of the wind field in the upper stratosphere: Tellus, 32, 207-214. Scaife, A. A., Knight, J. K., Vallis, G. K., and Folland, C. K., 2005, A stratospheric influence on the winter NAO and North Atlantic surface climate: Geophysical Research Letters, 32, 1-5.